The number of Americans without health insurance fell in all 50 states and Washington D.C. from 2013 to 2014, according to the United States Census Bureau. 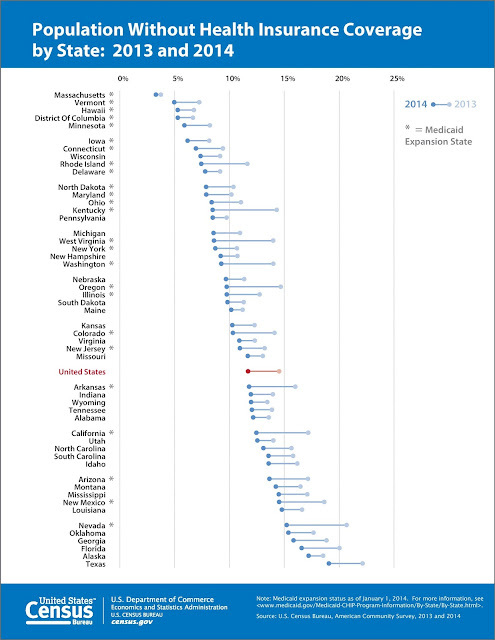 The biggest changes occurred in states that chose to expand Medicaid ― including Kentucky, Nevada, and West Virginia ― whose uninsured rates each fell by more than 5 percent. Texas, however, remains in last place. The Lone Star State saw a modest decrease of 3 percent in its uninsured rate, putting the state at 19.1 percent uninsured ― a far cry from the U.S. average of 11.7 percent.